Windows OS users can download apps for the Google Chrome browser as well as other Web apps. 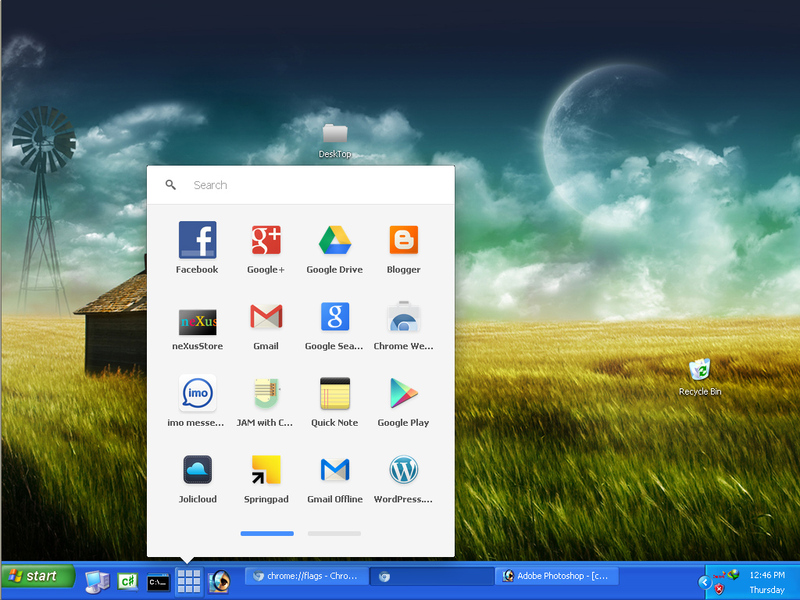 In a move to make using Chrome apps convenient for desktop users, Google has released a Chrome app launcher. Now, users would be able to start up the apps without having to first open the Google Chrome browser on their desktop PCs. They can simply open up the app launcher from the taskbar and fire up the apps they want to use. The launcher runs on Chrome OS, which is an operating system designed by Google to enhance the user experience for their Chrome browser. They don’t need to start up the browser every time they want to use the apps they have downloaded to their computers. The app launcher is displayed on the taskbar along with the browsers and other programs. You need only click on it to see the collection of apps which you can access directly from your desktop. All the Chrome apps you have downloaded on your computer are grouped under the icon providing you easy access. This also removes the need for full-fledged applications on your desktop. You can simply use the app launcher to start any app you want to use, whether you want to chat with your friends or read an eBook. The app launcher is designed as a means of convenience for Windows’ PC users as well as allowing Google a way into the PC market it doesn’t have a major share in. However, the app launcher is still a work in progress, currently in the testing phase. This is why you can only get with the developer version of Google Chrome for Windows. It may be some time before Google decides to release the new version of Chrome for Microsoft’s OS when the app launcher would become fully usable. Till then, you can try the app launcher on the developer version and get to learn how it could help you use Chrome apps. Bringing the app launcher to Windows is the first step in a long process. After this, Google plans to add the app launcher to other platforms including Mac and Linux. Given Google’s rivalry with Apple, it comes as no surprise that the company has chosen to go with Microsoft over it. Even on the other PCs, the app launcher would still be in trial mode with the full release some months off. It does give Google some time to work on their ‘PC invasion’. To download the app launcher, you simply have to access the developers’ channel on Google. One thing you do need to keep in mind is that the version of Google Chrome you are using would be replaced by a developer version to enable you to install and use the app launcher. The developer version is similar to the complete Google Chrome browser but is subject to crashes and other glitches. It might not be such a good idea to rely on it for browsing. Still, you would have to download it if you want the app launcher. of this blog, this weblog is genuinely remarkable. a blog post or vice-versa? My blog goes over a lot of the same topics as yours and I feel we could greatly benefit from each other. If you're interested feel free to shoot me an email. I look forward to hearing from you! Terrific blog by the way! "There is nothing in a caterpillar that tells you it's going to be a butterfly." by Richard Buckminster Fuller. on a website or I have something to contribute to the conversation. It is caused by the sincerness communicated in the post I read. look as if like a few of these comments come across like they are left by brain dead individuals? :-P And, if you are posting at other places, I would like to follow anything fresh you have to post.